Here are some great puppy food recipes to try making. Puppies love bacon, and in small quantities, it is not unhealthy, but like anything in excess it is bad. These recipes are for treats or biscuits. One simple modification you might want to make to the stock recipes, is to make the size is slightly smaller for copies. If you have several sizes of dogs you can make a batch of small sized treats and a batch of large sized treats. 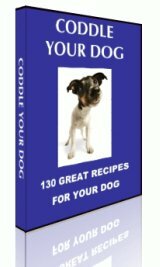 These puppy food recipes are from an unknown author, and these of all turned out to be very good puppy food recipes. Like I said, all of these use bacon to some degree. Mix ingredients together thoroughly. Roll out on a floured surface to 1/2 - 1/4" thickness. Bake for 35-40 minutes in a 325 degree oven. Mix ingredients with a strong spoon; drop heaping tablespoonfuls onto a greased baking sheet. Bake in a 350 oven for 15 minutes. Turn off oven and leave cookies on baking sheet in the oven overnight to dry out. In a big mixing bowl, mix all the ingredients thoroughly to form a dough. Roll the dough out with a rolling pin and use a cookie cutter to make shapes for cookies, Bake cookies at 350 degrees for 20 - 25 min. Combine flour, soda and salt; mix well and set aside. Cream butter and sugar, beat in egg and vanilla. Add flour mix mixing well. Stir in oats, cheese, wheat germ and bacon. Drop by rounded tablespoon onto ungreased baking sheets. Bake at 350 for 16 minutes. Cool and let the critters enjoy! Combine first 4 ingredients; mix well. Dissolve bouillon cubes in boiling water and add bouillon to flour mixture. Mix to make stiff dough. Roll onto a floured surface. Cut out shapes with cookie cutters (or a drinking glass turned upside down can be used). Bake in preheated 300 degree oven for 30 minutes. Let stand overnight to harden. This is the basic recipe. Variations: use clear gravies from turkey, roast beef, etc. In place of bouillon cubes or clear soups. Crisp sausage bits could be used in place of bacon. Different spices could also be used (Italian, parsley, thyme, etc. ).